Knowing that John’s of Bleecker Street would be closing at 11:30 p.m., Music City Mike kept an eye on his watch during the final moments of the Dave Alvin show at the City Winery. Unable to find a phone booth, I hurriedly transformed into my Pizza Snob identity during my brisk walk through the Village. I arrived at John’s with about fifteen minutes to spare and ordered a small six-slice cheese pizza ($14.50) with the caveat that I’d have to take it to go. 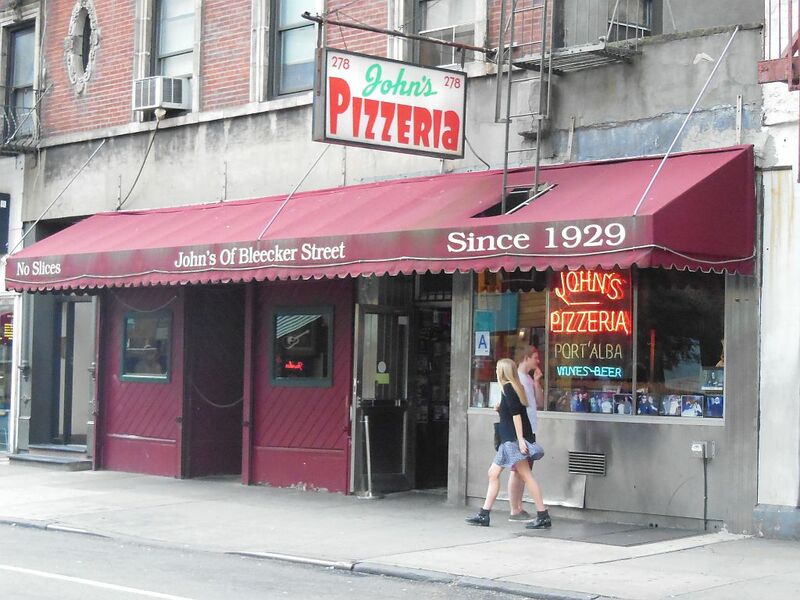 Located on Bleecker Street just off 7th Avenue, John’s is one of the few grandfathered pizza-makers in the City allowed to use a coal-fired brick oven. Founded in 1929, like many other famous spots, they boast a collection of celebrity photos and pizza awards in their front window. On the inside, one wall sports both a signed Pete Rose baseball jersey and an autographed photo of that late pizza-aficionado, Frank Sinatra. 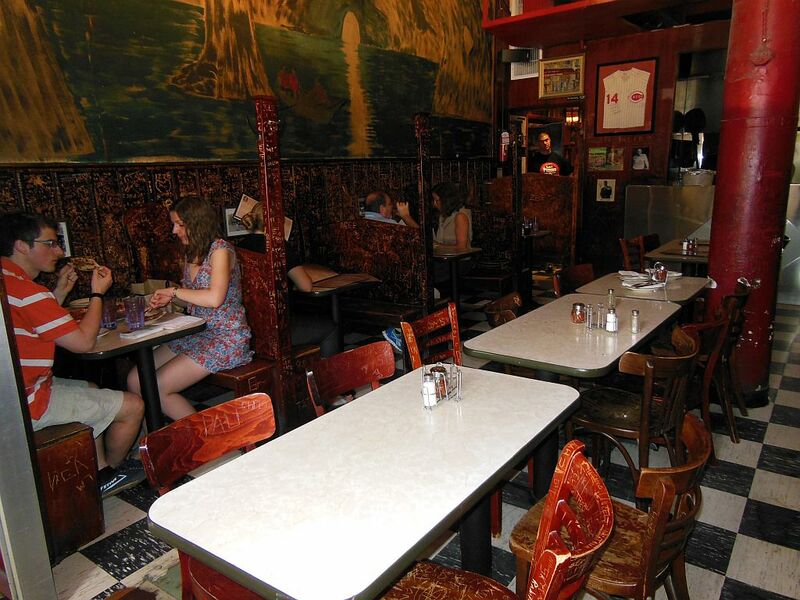 John’s has two adjoining rooms that offer seating in worn-out wooden booths that are completely etched with name carvings. 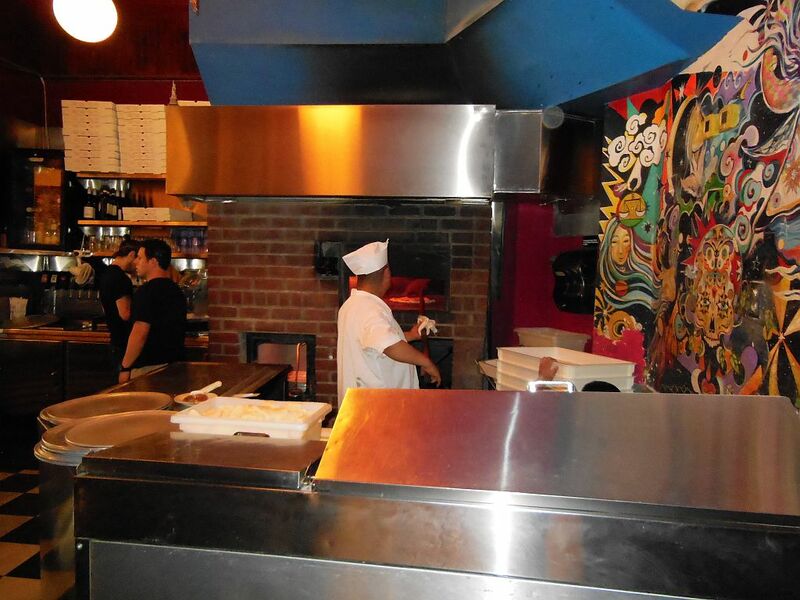 The coal oven is in the open allowing full view of the pizza-making process. Their menu is somewhat limited to pizza, calzone and a few pasta dishes and sides, but they also serve both wine and beer. No slices and cash only. Seeing that a young couple were still waiting to get their pie and dine in, I figured I could get away with eating a few slices right there out of the box. This would allow for a fresh evaluation before I took the rest home with me. When my pie arrived, my server mumbled no objection to my statement that I’d be having a quick taste on site. I immediately noticed that this pie had a rather different look. The layout of the cheese was sparse, not fully covering the pie, and the tomato sauce was also blotchy and slightly textured although not chunky. The crust was toasted black on both the bottom and the ends just like the menu warned. But most notable was the shine from a heavy splashing of olive oil. Looks aside, it was love at first bite–piping hot, chewy and delicious. I was blown away by both the lush and flavorful oil and the zesty sauce. The light cheese perfectly complimented the delightfully chewy coal-enhanced crust which was truly the star of the show. I managed to knock off three slices in no time flat taking the rest home for Mom and Dad. I made a return visit for lunch a few days later with some of my family. We ordered both cheese and veggie pies, and I was quite surprised that the veggie set us back an extra twelve bucks! My salad was not very exciting. While the pies were still well-received, the cheese pie wasn’t served as hot as my solo one the night before, so I was a little let down. 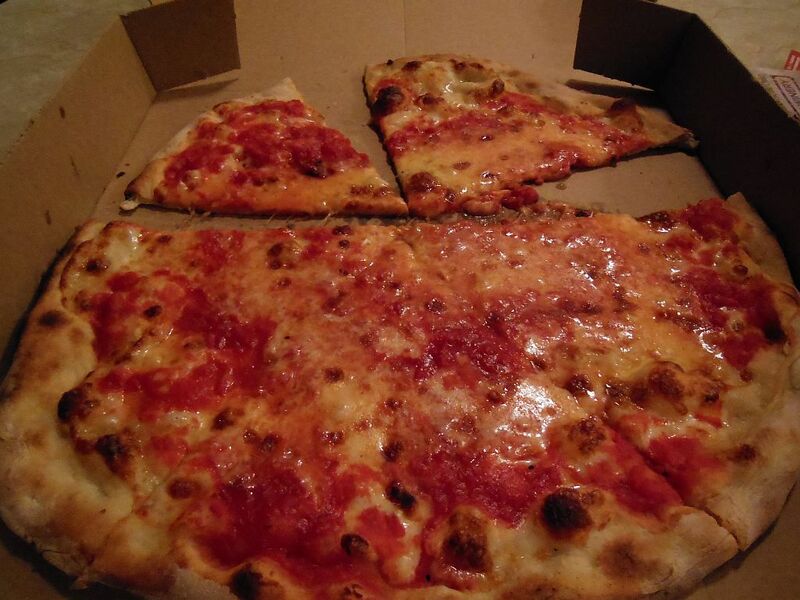 Nonetheless, John’s of Bleecker Street is a New York City landmark; and, along with Lombardi’s, is a go-to place if you are looking to experience the wonders of a coal-fired pizza in the Village. Best pizza, great memories. Loving this pizza since 1967.